Dandruff is a common scalp condition! But surprisingly, people are still not fully aware of it. They believe in various rumors that are spreading from one corner of the world to another. Thus, people trust, thoughts and views more than the advice of the dermatologists, who are specialized in such medical studies. Myth 1: All Flakes are dandruff! No! Many-a-times, flakes are a result of dry skin on the scalp. Though it seems just like dandruff, not all flakes are dandruff. The flakes are usually white and small in size, whereas the dandruff flakes are larger in size and yellowish in colour. If you find flakes in your scalp, don’t leave it thinking as dandruff, consult with a dermatologist and find the real cause of it. You might not be aware of the fact that even Psoriasis appears like dandruff, which is a typically significant skin condition. Right advice can relieve you quickly rather than opting for methods, of which you are not sure. Myth 2: Dandruff spread from person to person! This is a misconception about dandruff. You cannot catch dandruff from someone else; it’s a scalp affliction that you can catch only by treating your scalp poorly. Myth 3: Washing hair every day can give you an escape from Dandruff! Washing hair each day will take away the natural oil of your scalp. This will make your scalp skin more dry and irritated. So, it’s a bad idea to have a head wash daily and induce more dandruff. Myth 4: Dandruff is due to bad hygiene! Though regular shampooing can keep dandruff under control, it cannot prevent this scalp skin condition since dandruff can be caused due to various factors, including the overproduction of hair oil or due to the presence of parasitic microorganisms on your scalp. Myth 5: Dandruff occurs only on the scalp! This is again a misconception! 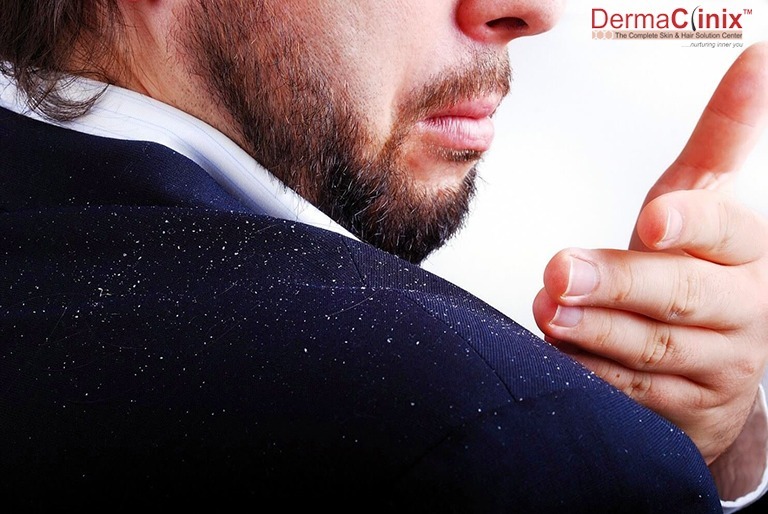 Though there is a higher probability of noticing dandruff in the scalp region, you can find dandruff on other body areas like eyebrows, ears and even around the nose. Myth 6: Dandruff causes Hair fall! It’s true that both conditions are somehow related to each other, but the dandruff is not the real culprit behind the hair fall. Dandruff, actually, makes you scratch your head, which eventually causes breakage of hair. The real cause of hair fall includes diet, anxiety and the health of the scalp. If you wish to discuss hair loss problem, consult with a reputed dermatologist now! Myth 7: Dandruff worsen in summer! This is a misconception. The reality is that people are more susceptible to dandruff related problems in the Winter since the weather is dry and they eat a lot of full-fat dairy products, spicy foods, sugary products and champagne. And this is accompanied by the stress of holiday planning, budget planning, etc. All this aggravates the problem. Myth 8: You should not exfoliate your scalp! Applying an exfoliating scalp mask is actually helpful for you as it can easily lift away flakes and increase the recovery of skin cells on the scalp. But, one should keep into consideration to stay away from DIY scalp exfoliators with sea salt as the key ingredient. This is because the salty composition can irritate the skin, and worsen the scalp condition. Hope that now you have a better perspective towards this scalp condition. If you still have any query regarding Dandruff, hair fall or any other hair condition, visit a qualified dermatologist. Are you struggling with dandruff? DermaClinix is top-rated Skin and Hair clinic situated in South Delhi at Defence Colony with highly-skilled dermatologist from the most reputed medical institutes of India. DermaClinix is equipped with cutting-edge technology machines with which they deliver the best possible solutions to your conditions.